Earlier this year we initiated a project called ‘A Tribute Project’. The main idea of the project is to develop a signature product that we dedicate to the most influential and inspirational friends, from our own perspective. For the first part of the project, we featured Mamin Dita Wistarini and created Mamin’s Birdie Bag signature series. Mamin has been our long time inspiration. Not only on creative matters, but also on how to live a happy life, on how to keep dreaming and chasing it, everything. No further explanation needed why we chose you. Everyone knows that you’ve been our long time guru, our favorite designer, our coolest couple role model, our family inspiration. 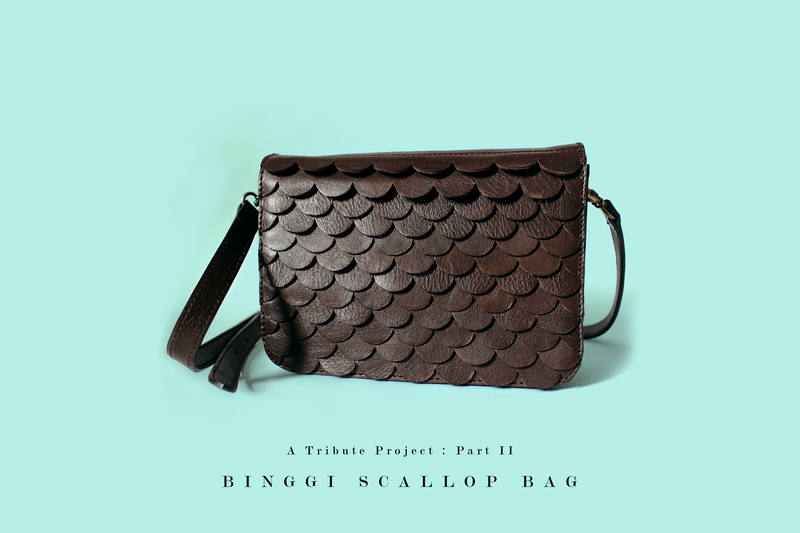 That’s why, we would like to dedicate this Scallop signature bag special for you. Even harder than the first one, it took us almost a year to develop this signature bag. After a series of failure (mostly because the design is too ‘ambitious’ and no one could made it), we finally came up with something simple and at the same time, very ‘you’. Well at least that’s what we thought of you. As a long time fans, both of us agreed that one of your signature element is the scallop pattern. It might be a little subtle, or you never even consider it as a signature but somehow we can see it. There are scallops in your works, and or your personal items. Somehow, somewhere. Somehow, scallops always remind us of you. This Scallop signature bag is what we see in you. It’s our way of showing respect towards you, and saying thank you for all of good times together. 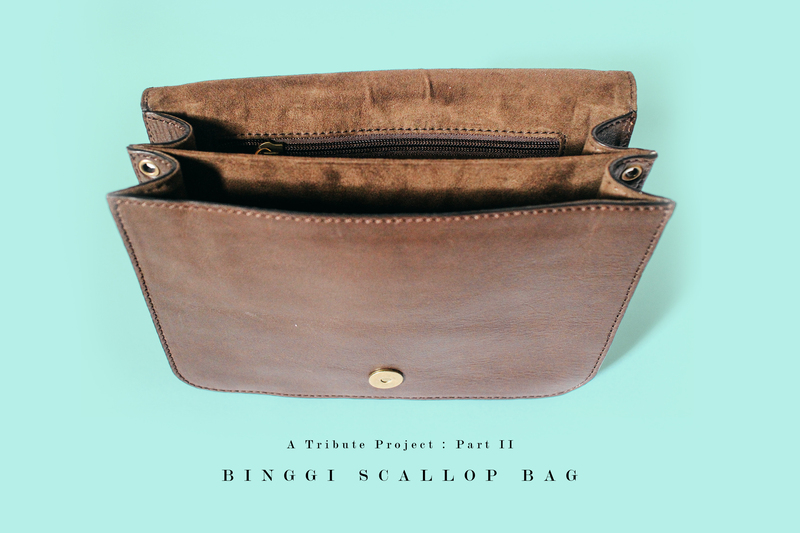 Binggi’s Scallop Bag is part of our Tribute Project. In this project, we designed three personalized leather bags which we dedicate to three different women who have been our all time inspirations. We have released the first part earlier this year featuring Dita Wistarini of The Neverland Family. And for the second part, we would like to dedicate this leather bag to Thalia Kamarga of www.avocadolite.com. Thalia has been our long time inspiration while at the same time, a very warm friend. Just like Dita who is called Mamin by her kids, Thalia also have this special name called Binggi. It’s what her daughter Aina calls her. Just because it’s the second part of the project, doesn’t mean it’s getting easier. 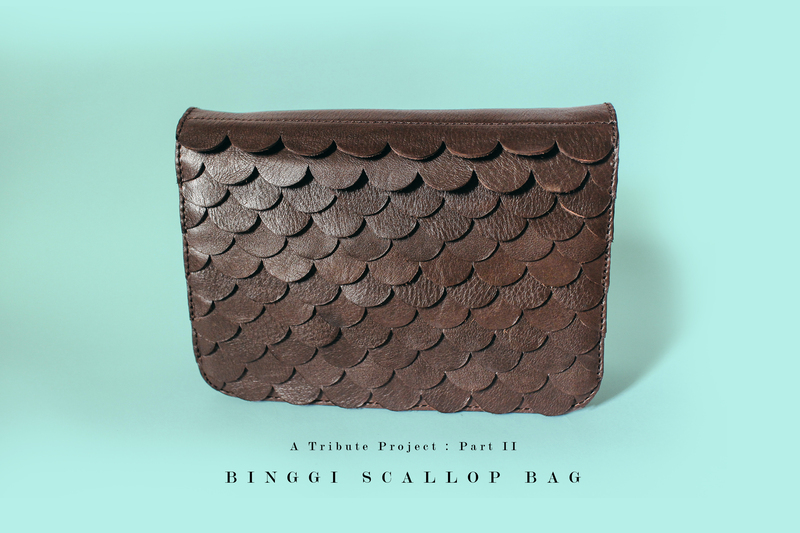 As we mentioned in our personal letter to Thalia above, we’ve made several bag prototypes before we finally came up with the Scallop bag. Our very first idea was to make an Origami bag. Thal is into Japanese and crafty and all, so we thought origami is a perfect idea. The design and prototyping process for the origami bag was pretty complicated as it involved some math equations (LOL!). But seriously, the maths and all the technical stuff were part of the main idea. You know Thal is one of the best illustrators and graphic designers, but maybe not many of you know that she was also an engineer. So we wanted to create something very technical and artsy at the same time. Ambitious, we know *laughs*. Too bad our leather crafters said the bag was impossible to make. At least not in home industry kind of manufacturing. They gave up on us *sigh*. After a lot of discussions and long creative process, we finally came up with the Scallop bag idea. The final result is impressive, we’re so happy and really love it. And we hope Thal would love it, too. Like always, we won’t keep all the happiness to ourselves. We would like to share this 100% genuine leather bag with Thalia’s dearest friends in a very limited quantities and limited time.